You may have thought the glory days of the cronut were long gone; you were wrong. The phenomenon lives, and the proof is in the crowds at Bengees Ice Cream Crafters. The tiny shop opened in February just off of South Lake Avenue, and it’s already attracting a steady stream of regulars who can’t get enough (or take enough Instagram-worthy photos) of their Creamy Buns, a.k.a. cronut ice cream sandwiches. 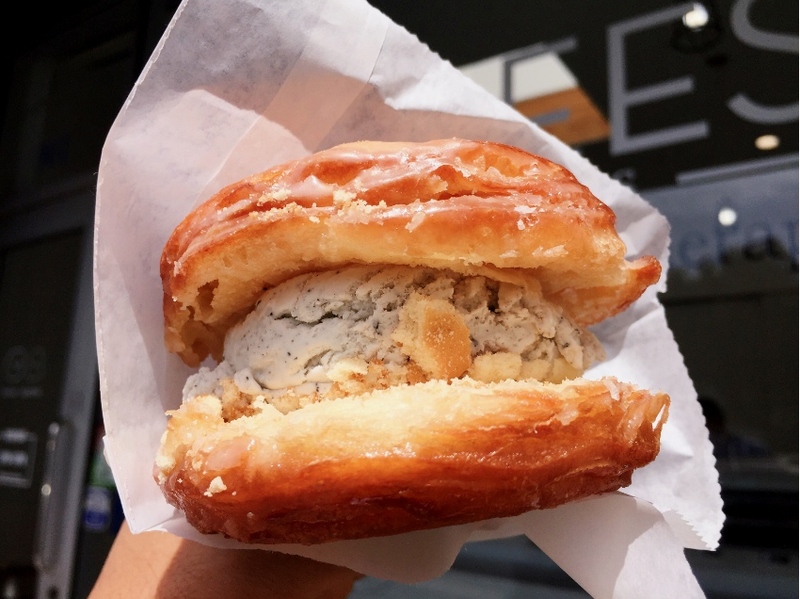 If the term “Creamy Bun” sounds familiar, you might be mistaking it for the “Milky Bun,” the doughnut ice cream from Afters Ice Cream, which opened a location in Pasadena about six weeks before Bengees. The Milky Bun was dubbed the next cronut by NBC News, and the novelty treat formed the backbone for Afters’ seven-location-strong mini empire that also boasts 151,000 Instagram followers. Still, Bengees owner Foulay Saelor says he’d never even heard of Afters until recently when a customer told him about the chain. He also says—and even dug up some evidence from an early Yelp review—that he originally called the concoction “the Bengee,” but eventually changed the name on the advice of a friend who thought the name and the product could be better correlated. And the similarities between Afters and Bengees don’t end on the menu boards. Both shops have punchy phrases plastered on the walls that double as Instagrammable backdrops: Afters has Millennial-facing platitudes like “less talk, more ice cream” and “ice cream is cheaper than therapy” whereas Bengees has “and then, ice cream” and, simply, “ice cream therapy.” The slogans are almost identical, even down to the simple, blocky font and black and white typeface. Yelpers have noticed the glaring similarities too. “Oddly similar to Afters, the decor, croissant ice cream sandwich, etc.” says Marissa R. “BUT Afters doesn’t have delicious vegan options so this is my go-to!” Saelor agrees that his vegan items set his store apart, and the nearby plant-based restaurant Real Food Daily offers plenty of supplemental customers. Other Pasadenans are grateful for Bengees offering a reprieve from the perennially long lines at Afters. “I love that the location isn’t in old town, because it means less crowds (cough, Afters, cough) for the same great taste and service,” says Garen A., who definitely doesn’t have a cold, before adding that he prefers the cronut version at Bengees’ anyways. Intellectual property is a tough issue to tackle in the restaurant industry. No one can prove that they truly invented a certain dish or cooking method, so most legal protections are limited to nomenclature, hence the Creamy Bun versus Milky Bun distinction. In any case (at least according to the Yelp mob) it seems that this ice cream doughnut sandwich rivalry is only benefitting the sweet-toothed consumers and raising the city-wide standards for cold ice cream in hot dough. And who could be mad at that?